CONIPANIES OF THE TENTH DISTRICT. Engine No. 1, as its number indicates, was organized when the Paid Department came into existence. It was installed in the house on Fourth Avenue, between Eighteenth and Nineteenth Streets, which, prior to that time, had been occupied by Putnam Engine No. 21, of the Volunteer Department, and remained there until Aug. 20, 1891, when it was reorganized and moved to a new building of better design and more ample accommodations on Fourth Avenue, between Fifty-first and Fifty-second Streets. The building is of buff colored brick with trimmings of red sandstone, and is an ornament to the neighborhood. While there is little or no pretension to embellishment on the interior, it is neat and comfortable and well adapted to the purposes of the company. In its early days this company had a large, but not a particularly populous district to cover. For the past ten or twelve years, however, building operations have been brisk, and where vacant lots and wooden dwellings were once numerous, there have been erected many fine large factories, public institutions, and apartment houses. Early in the year 1889 Commissioner Ennis was appealed to by the property owners and residents of the lower section of the Eighth Ward for better protection from fire. The district had grown wonderfully, and as a truck company was needed in the neighborhood the Commissioner took occasion to transfer the engine as soon as the house was completed and ready for occupancy. James Connors, who served as Foreman for several years, and was then Assistant Foreman of Engine No. 1, was placed temporarily in charge, and was subsequently promoted to a foremanship, and his place at the head of the company was made permanent. The district is bounded by Prospect Avenue, New Utrecht, Bay Ridge and New York Bay. Among the important buildings in the district are many large structures where machinery is used, including the electrical stations of the Brooklyn City Railroad Company, from which several lines of surface trolley cars are to be operated, the big factory of the United States Projectile Company, where the manufacture of shells for government guns is a specialty; the oil refinery of Bush Denslow, and the large paper manufactory founded by the late Robert Graves, several large factories where high combustibles and explosives are the output and stock in trade, the great storm shed of the South Brooklyn Terminal Company, and the ferry house of the Thirty-ninth Street Ferry alongside. All these contribute materially to the possibilities of serious and disastrous conflagration within the limits of the baili- wick so creditably covered by Engine No.1. Since the reorganization of the company a few months ago it has had little chance to distinguish itself, but what duty it was called upon to do was performed satisfactorily. It was in its early days and while in the old quarters that the company won praise for valiant services. It was a tradition that " Engine No. 1 " was always first at a fire, and the last to leave and did the most effective service. The engine was formerly in the service of No. 9. It is a second-class Amoskeag, and while yet in perfect condition was one of the first brought into the Department. The tender, or hose-carriage, is one of the " old originals," and is equal to the emergencies that beset its path. " Harry," " Jim " and "Jerry " are the engine pets that speed their way to fires. Their intelligence and affection are not to be overlooked. They require no urging or driving, when the noisy, clanging gong denotes a conflagration and summons No. 1 in haste to the foremost line of duty. Foreman JAMES CONNORS was born in Brooklyn, Aug. 8, 1844 His appointment, made Sept. 15, 1869, places him among the oldest and most reliable members of the Department. In his youth, through the medium of the Volunteer Department, he was enabled to satisfy an ambition for fire-fighting. When old enough he became actively identified with Hose No. 14, which was then quartered in Ninth Street near Third Avenue. Here he speedily earned promotion to Assistant Foreman, a position he held until the advent of the Paid Department of which he became a member. The rapidity with which Foreman Connors forged ahead in his new place, and the events of his period of duty, confirm the adage that " a good man cannot be kept down." On Jan.23, 1872, in recognition of faithlful and earnest work, he was elevated to the rank of Foreman, though only to be reduced to the ranks seven years later by an act of the Shannon - Commission. The following year his worth was again proven by his reinstatement as Foreman, but on Oct.21, 1881, among others he suffered another reduction to the ranks. For six years thereafter he continued as a private. When the position of Assistant Foreman was created he was one of the first men appointed by Commissioner Ennis, being fourth on an eligible list of over fifty. This occurred March 1, 1887. Under the same official he worked his way back to his old post, his advancement taking place June 9, 1891 Foreman Connors, like many other veterans of the Department, has had more than one narrow escape from instant death, besides sustaining bodily injuries several times. At the big fire which demolished the extensive warehouse buildings of Woodruff & Robinson in 1872 , he was stationed in front of the building, When ordered to the rear. He had hardly reached there when the front of the structure fell in with a thunderous crash, almost upon his back. At the same conflagration he ascended a ladder which rested on an insecure shed, part of an adjoining building. Several firemen also climbed the rungs. They had just thrown a stream on the roaring flames when a creaking sound below attracted the attention of the men. They. had scarcely turned their heads to learn the cause of the noise when the roof gave away leaving a small patch secure enough to keep the ladder and its imperilled occupants from being precipitated into the ruins, which meant a horrible death. Assistant Foreman HENRY PLATT was born in New York City, May 22, 1856 , was appointed a fireman April I, 1885, and assigned to Truck No.1. Later he was transferred to the fire-boat " Seth Low." On Feb. 13, 1 892, he was made an Assistant Foreman and assigned to Engine No.1, where he has served creditably since. With others the last big fire in Pratt's Oil Works, Greenpoint, saw him detailed for ten days by his superior to guard the ruins against a fresh outbreak. It proved his longest and most eventful period of out-door duty since he joined the Department. Engineer ROBERT STACK was born in New York City, March 14 , 1862, and was appointed July 1, 1885. His first duties in the Department were performed as a fireman on Engine No. 28 . He was made Engineer Feb. 10, 1891, and his transfer to Engine No. 1 occurred when that company moved into its present quarters. Engineer Stack sustained painful injuries at a fire on Conover Street, near William, in the winter inter of 1888, by accidentally falling from a two-story window to the street. The mishap confined him to his bed for two weeks. GEORGE SPRAGUE, Assistant Engineer of Engine No.1, was born Jan. 14 , 1846. He received his appointment April I, 1890, and became a member of Engine No. 6, receiving his promotion as stoker sixteen days later. From Engine No. 6 he was tansfer to Engine No. 28, upon the organization of the latter, and reported for duty to Engine No. 1, the day it located in its present place. Mr. Sprague enlisted in the Navy on April I?, 1863, and received his discharge April 13,, 1865. He arrived in Washington on the night Lincoln was shot. His two years of service were put in on board the government dispatch vessel " Cactus," which is to-day doing duty in the Federal Light house Service. ALEXANDER F. NORTON was born in New York City, March 7,1863. He was appointed Oct. 14, 1890, and was assigned to Truck No. T. He was transferred to Engine No. 1 Aug. 20, of the following year. WESLEY SPRAGUE, a son of George Sprague above, was born Dec. 28, 1868 His appointment was made Jan. 31, 1891. He first reported for duty to Engine No. 28, and has been with Engine No. 1 since it has occupied its present house. THOMAS F. NOLAN was born at Fort Hamilton, July 2, 1864. 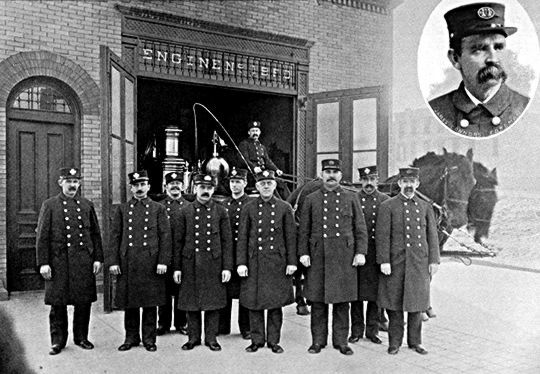 He was appointed July 15, 1889, and began his fire career on Truck No. 5.. On April 17, 1890, he was transferred to Engine No. 28, where he filled the position of driver. His connection with Engine No. 1, where he also handles the ribbons, began in 1891. JOHN J. SHANNON was born in Ireland, July 9, 1867. He received his appointment March 12, 1891, and after serving on Engines Nos. 2 and 28 respectively, became attached to No. 1 in 1891. LOUIS FRITSCHLER , who drives the hose-cart of Engine No. I, was born in Baltimore, Md., in the year 1846. He served five years in the Fifth United States Artillery Band prior to his appointment in the Fire Department, which was on Aug. 6, 1883. He reported for duty to Truck No. 1. His transfer to Engine No. 1 occurred Jan. 24, 1884. A short stay with the latter organization was followed by an official order to join Engine No. 28, and in 1891 he returned to Engine No. 1. This is the start of your home page, my gift to you.